Today Pinterest introduced a new feature called Place Pins. It looks immensely helpful when planning your next vacation with family or friends, and what retailer wouldn't love to be featured shop to your city's best shopping! Below you will find Pinterest's announcement on Place Pins. 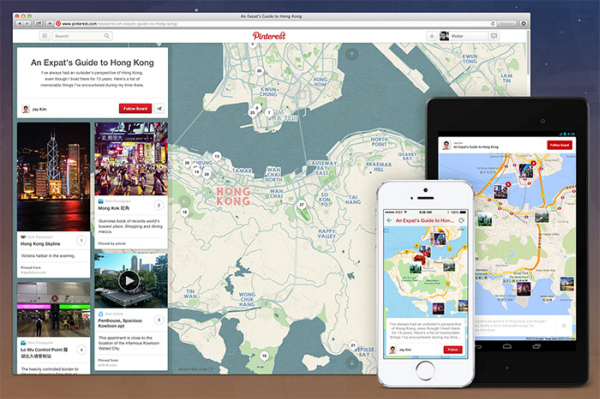 We’re excited to introduce Place Pins, which let you get a map of your Pins on all of your travel boards. Now, it’s even easier to plan a vacation with friends, create a collection of memorable places or plot out any of your interests by location. Ready to get started, jetsetter? Go to any of your travel boards and edit its settings to add a map to your board. Then, add your Pins to the map! Get a beautiful, interactive map on your board when you add places to your Pins. Use it to save some of your favorites: the best burgers and brews in the Big Apple, Britain’s finest national parks, or a local guide to Paris. Each Place Pin comes with extra details on the Pin, like the address and phone number, so you can look up important info before a night out or on a weekend adventure. Even better, you can look up directions to places right from your Pins! Place Pins are available on web and mobile, so it’s simple to add and view places from just about anywhere. Take your Pins with you as you the navigate the busy streets of a foreign city or stroll through a quiet park in your hometown.